TLC Faux Finish Painters, Florida Painting Contractors, Venetian Plaster Finishes, Mural Artists - Professional Painters, Fort Lauderdale Faux Finishing and Venetian Plaster. Ceiling with venetian plaster and hand painted mural painting by TLC. Venetian plaster on ceiling and faux marble column painted by TLC. Custom faux finish painting in south Florida, master faux artists. We can custom match almost any surface, wood, granite, marble, more! We service south Florida from West Palm Beach, faux painting in Boca Raton, custom finishing penthouses on Miami Beach and south to the Florida Keys. Luxury custom faux finishes and home decor! Professional Paint and Design Services. TLC Interiors & Exteriors Inc. Licensed south Florida painting contractors TLC are experts at decorative faux finish painting, venetian plaster, kitchen and bath cabinet resurfacing, custom designs, faux painting wood grain, faux marble, gold and silver leaf, glazing and more! Expert textured plaster finishes or smooth polished venetian plastering with marble and lime. Authentic Italian venetian plasters, marmorino plaster, spatula stuhhi, stucco on interiors and exteriors. Venetian plasters in Boca Raton, Venetian plasters Miami. Venetian plaster in Broward county. For luxurious home decor and house painting, Fort Lauderdale stucco and plastering masters at TLC create top quality, beautiful wall finishes. Family owned, the painters are a team of high end, true artists. Painting wall and ceiling murals, artistic decorative finish masters, offering custom house painting in Fort Lauderdale, Miami, Boca Raton, Palm Beach and the FL Keys. The studio owner Jeanne Hall, is a licensed south Florida painting contractor with teams of professional ﻿painters in Fort Lauderdale﻿﻿﻿ Florida, Miami and the FL Keys. Faux finishes, venetian plasters and murals are our specialty. 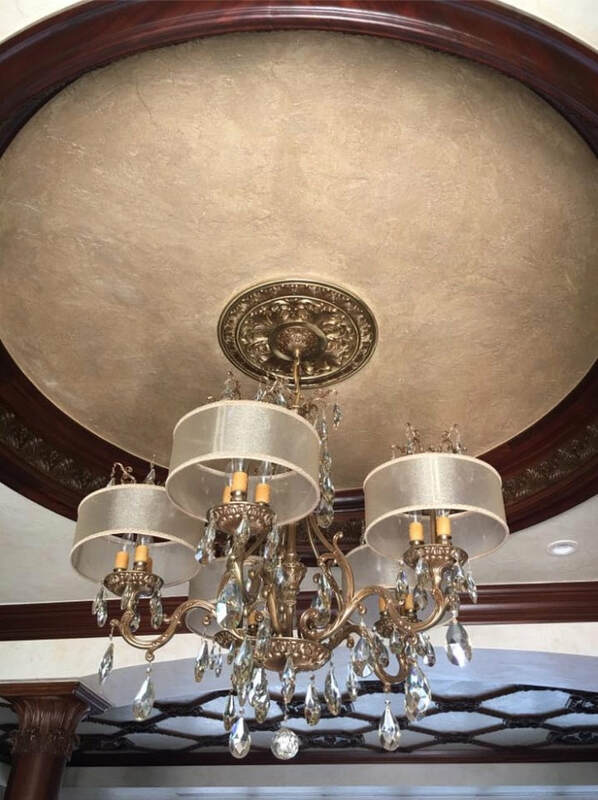 We create advanced wall textures, do venetian plaster repairs, interior and exterior stucco, antiquing, decorative faux finish painting in Miami, Ft Lauderdale and surrounding south Florida homes. We work for south Florida home builders, designers, decorators, businesses and homeowners. ﻿We are highly skilled at advanced surface techniques, glazing and custom faux finishing. Florida Painting Contractors at TLC Design Studio provide home improvements and custom painting services in Fort Lauderdale, faux finish painting in Boca Raton, venetian plasters in Delray Beach, mural artists in Miami and the Florida Keys. We offer all of our high end faux finishes and custom painting services in south Florida regions from West Palm Beach to Key West. We will travel to you. Contact TLC for painting and plastering services. We are licensed painting contractors in south Florida, mural artists and painters. We create unique mica finishes, stencils, antique glazing, cabinet resurfacing and options for remodeling kitchens and bathrooms. In Fort Lauderdale, Miami, Boca Raton and surrounding south Florida areas we offer custom artistic faux finish painting expertise and luxury home decor. We work for builders and directly with homeowners. We are professional painters in Fort Lauderdale, FL Keys and Miami painting contractors. House painters for interiors & exteriors, we specialize in decorative painting, glazing, murals for ceilings and walls, custom wall finishes, venetian plaster and faux painting in south Florida. Painters in Southwest Ranches, Weston, Deerfield Beach, Pompano, Hollywood, all areas in Broward County, Miami Dade and Palm Beach. ﻿TLC painters, muralists and fine artists in Fort Lauderdale FL. Jeanne Hall fine art photography for sale. We paint and sell unique, one of a kind decorated home furnishings. Furniture refinished with chalk paint® by Annie Sloan. Refinished furniture in Fort Lauderdale by TLC artists. Please note** We no longer sell Annie Sloan chalk paint - although we love the product, and use it ourselves. ﻿Want to write a review for us? TLC Design Studio is on Yellow Pages. Professional painters in Fort Lauderdale. Faux painters, painting classes in Fort Lauderdale. Painting Company in Broward County. TLC Design: Painters in Ft Lauderdale﻿ Florida, Home Decor Fort Lauderdale Faux Painting, custom faux finishes, venetian plaster, professional repairs and installations, hand painted furniture.